These easy Chocolate Chip Cherry Cookies are a delicious treat to add to your holiday cookie trays this year. 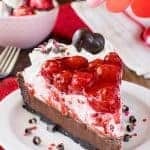 The hidden cherry under the chocolate is a sweet surprise! We pulled our tree out of storage this past weekend. Since we moved last December, that poor tree has been in the box for two years now. Some of the branches were a little bit flat and resisted my fluffing efforts. Hopefully after a few days it will puff back up. If not, at least all the ornaments, lights, and beads should hide those flat branches. I had every intention of getting the rest of the decorations out too, but before I knew it the weekend was over. The motivation to get it all done just never showed up. I think I was still tired out from going Black Friday shopping with our daughter. She was determined to experience the craziness of shopping on the day after Thanksgiving. At first I tried to talk some sense into her. But then I realized that we didn’t have any particular item we were searching for, so we headed out to just see what things we could find. After grabbing some coffee and a muffin, we arrived at the store. The parking lot wasn’t that full. As we walked through the store, it wasn’t that busy either. 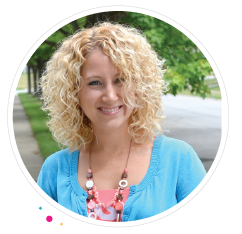 I think most people have decided that crowds are not worth it, and they are taking advantage of online shopping. My daughter kept looking around for the crazy people that I had warned her about. As we were leaving she said it just felt like a normal day at the stores. We optimistically headed to the mall because we thought for sure it wouldn’t be crowded either. Turns out that everyone else must have had that idea because there were a few stores that we walked into and we turned right around and left because of the lines. Even my daughter took one look and decided she didn’t even want to look around the stores because there were too many people there. At least she got to see some of what I was trying to explain to her. I like shopping, but it just isn’t as much fun when there are big crowds of people all around. I would much rather be in our kitchen baking homemade brownies or cherry chocolate chip waffles. Now that the holidays are approaching at the speed of light, it’s time to finalize our cookie baking list. Every year we usually have a list of about 10 different cookies, fudge, and popcorn that we try to make and share. Ok, so I say we…but really this list is my doing. My family would be fine with passing out Oreos and chocolate covered cherries in boxes to everyone. 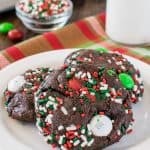 Most of the recipes that make my holiday treat list are tried and true favorites, but lately I have been trying to create one new cookie each year for some variety. This year I was inspired by those chocolate covered cherries. I wanted to include them in a fun holiday cookie…without actually using the boxed cherries. 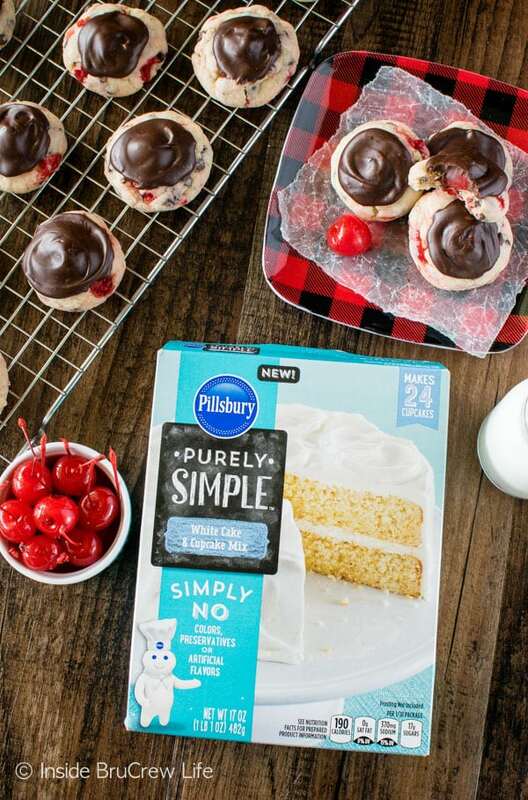 This fall I am partnering with Pillsbury to show you easy and fun recipes using their products! If you have been reading for very long at all, you know that my favorite way to make cookies is from a cake mix. They seriously produce the softest, puffiest cookies around! My family absolutely loves when I bake cake mix cookies. It’s a good thing they do because over the years I have made quite a few different flavors. Some of my favorites are these Oreo peppermint crunch cookies and these cinnamon caramel cookies. After one bite of these chocolate chip cherry cookies, this treat went straight to the top of my baking list for this year because they were so good. 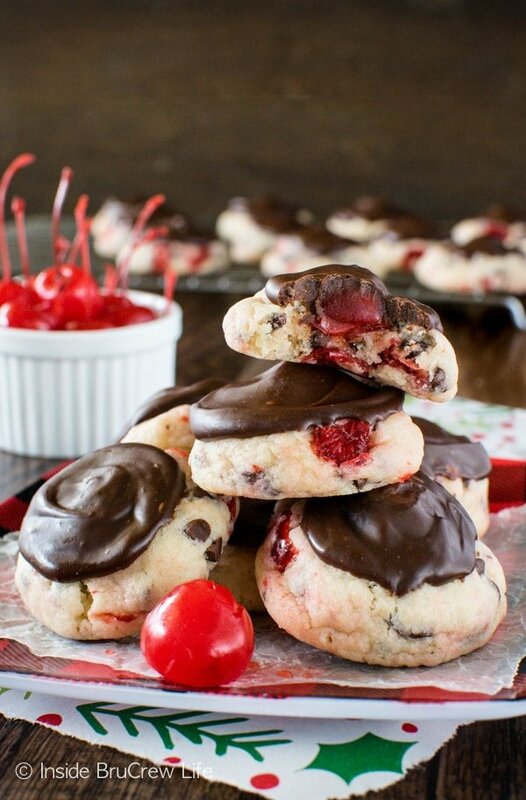 If you love cherries, this is the cookie for you. I suggest heading to the store ASAP to buy the ingredients for a fun baking day! Just make sure you have friends to share them with because you might eat the entire batch. 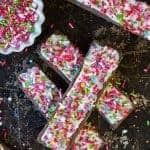 How fun are these little Sprinkle Snowball Cookies from In Katrina’s Kitchen? I love the hidden bits of color. 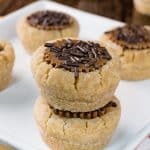 I am a huge fan of sweet & salty, so these Salted Caramel Pudding Cookies from Beyond Frosting are calling my name. A batch of these Soft Gingerbread Cookies from Bless this Mess would be so fun on cookie trays. 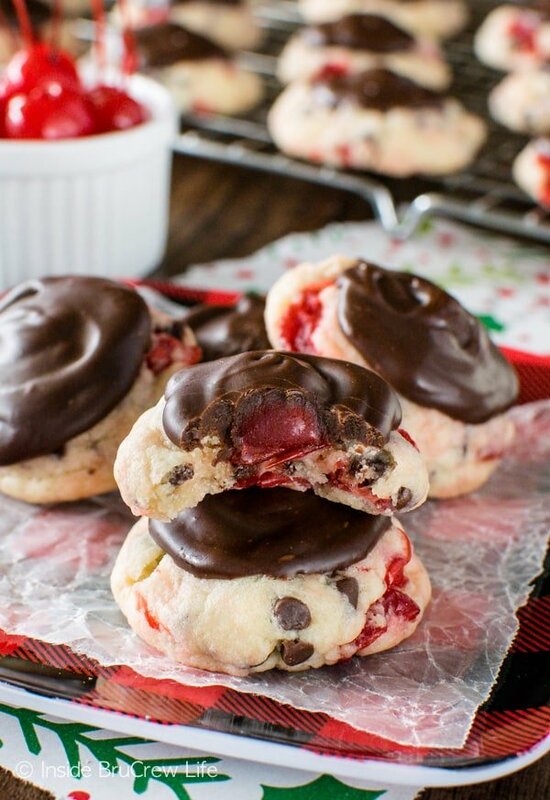 These easy soft Chocolate Chip Cherry Cookies are a delicious treat to add to your holiday cookie trays. The hidden cherry is a fun surprise to find. Beat together the cake mix, butter, and egg until soft dough forms. Add the cream cheese and beat again until mixed in. Drain the jars of cherries. Set aside 36 cherries. Dice the remaining cherries and pat dry again. Stir the diced cherries and mini chocolate chips into the cookie dough very gently. Refrigerate for 1 hour. Roll into 36 even dough balls. Bake for 8-9 minutes. Remove and let the cookies cool on the pan for 2-3 minutes before moving carefully to wax paper on the counter. Press the remaining cherries into the tops of the cookies. Let cool completely. Place the chocolate chips and heavy whipping cream in a microwave safe bowl. Heat for 30 seconds. Stir and heat again for another 30 seconds. Stir until melted and creamy. Cover the tops of the cookies with the melted chocolate. Let set. Store in a sealed container. My husband loves those chocolate-covered cherries in a box. Me, not so much. 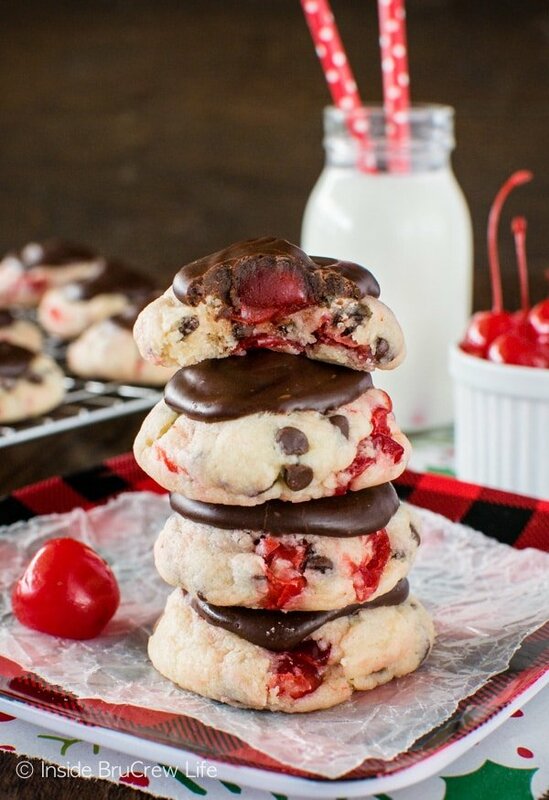 He would adore these cookies and get excited because I never bake cherry anything. Thanks for the recipe. 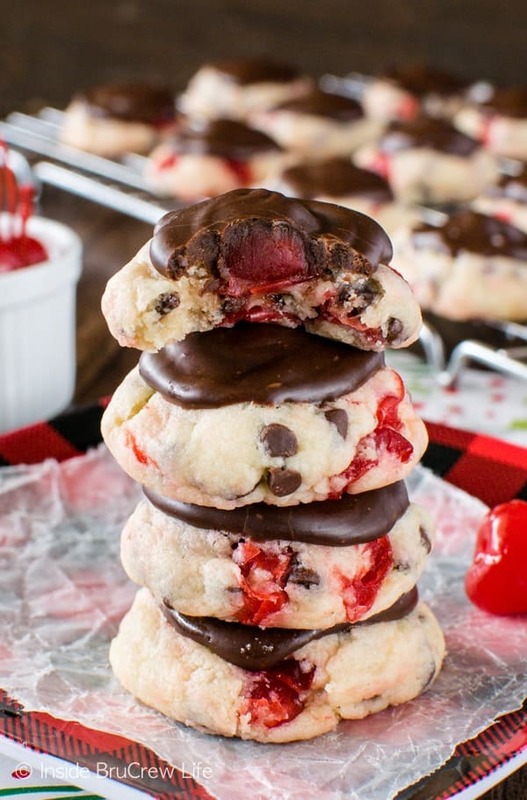 These cookies look so puffy and love the chocolate covered cherry on top! 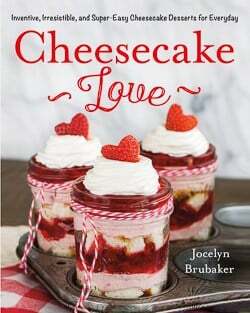 I thought I had most of my cooking baking finished, but am thinking of adding this recipe, too. Love the chocolate covered cherry on top! Great addition to the Christmas dessert table! They didn’t long enough in our house to find out. I think they would freeze fine. Although I would layer them with parchment paper so they do not stick together when they thaw out. Keep scrolling past the pictures. The printable recipe box is under the 5th picture. 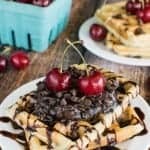 Has anyone used a cherry chip cake mix for this? I just used a vanilla cake mix, but I think the cherry chip cake mix is a great idea!!! I live in Australia what would an equivalent be for the Pillsbury cake mix or is any white cake mix ok? You should be able to use any white cake mix that is available to you. I hope you enjoy the cookies! Scroll down below the pictures and there is a printable recipe card with the recipe on it. I hope you enjoy the pictures! how big should the balls be? I only have whipping cream not heavy. Will that work? Whipping cream will work just fine. I think the dough balls should be about 2 Tablespoons roughly. I just scoop the dough out and make 24 balls, then adjust them to be the same size. oops… didn’t you mean “36” balls as mentioned with recipe? Oh, my…yes, I meant 36 dough balls. Sorry, it’s been a busy two weeks around here! 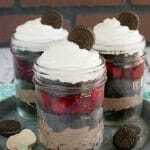 I want to make these today and don’t have a white cake mix? Can I use a Devils food mix? Yes, any flavor cake mix works for these cookies. I think a chocolate cookie with the cherries would be great! Where is the recipe ive read all the comments still can not find it ive been.looking for 20 mins. If you are reading the comments, then you have scrolled way past the recipe. The printable recipe card is right under the 5th picture. I hope you enjoy the cookies! I used my 1 tbsp cookie scooper and made 56 of these beauts! I topped each with 1/2 a cherry instead of a whole one. Made this for a cookie contest at work this Christmas and it was a WINNER! Everybody loved it. Doubled the batch so there would be plenty for all and there was not one left. Sprinkled a little powdered sugar on them to give them the look of fresh fallen snow. They were so pretty and oh so yummy! Yay! I am so excited to hear that! And I love the sprinkled “snow” idea on top!!! Merry Christmas! Tried these today. Added almond extract and left off the chocolate icing. My family like them. These will be enjoying more for Christmas. Thank you. I made these and while they did not look like the picture my guests enjoyed them. I would not make them again. The dough was very sticky even after refrigerating it. I had some cookies with lots of chips or cherries and some with less. The cherries on top didn’t stick until the chocolate was on top. Overall it was alot of work and some expensive ingredients for an okay cookie. I am so sorry to hear that you didn’t enjoy the cookies that much. I usually will refrigerate the dough longer if it seems sticky, and I try to scoop carefully to get an even amount of cherries and chocolate chip. At least your guest enjoyed them!!! !